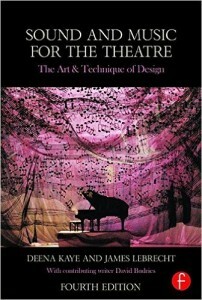 Sound and Music for the Theatre: The Art and Technique of Design is considered ‘the bible’ by many working professionals, and is the companion publication to technical books for university and professional school studies. This collaboration with James LeBrecht was originally published in 1992 and is now updated to a third edition. It is available in most bookstores. For more information visit our Facebook page or FocalPress.com. I am based out of Manhattan, but also work with students via Skype. Please click here to contact me for more information. I look forward to hearing from you.